Don’t let the size of your RV restrict you from seeing what’s behind your vehicle. 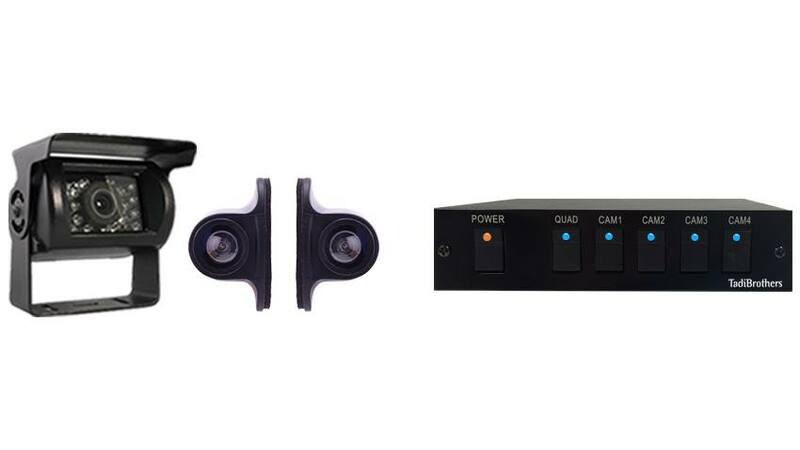 This RV backup camera system makes it easy to see everything going on around your vehicle, keeping you safe and secure. You’ll never have to worry again about hitting something while backing up or switching lanes. Whether you’re an experienced RV driver or have recently purchased your very first vehicle of this size, you can never be too careful. Our RV backup camera system gives you peace of mind in knowing both your family and your vehicle will be safe from harm. The open road is full of surprises. You can’t predict the road conditions you’ll experience or the tight parking situations you’ll find yourself in. Purchasing this RV camera system is an investment you won’t regret. This NTSC/PAL video system is easily compatible with all of our cameras and monitors and offers four video inputs for maximum coverage. The durable, steel-housed camera is waterproof, offers military-grade night vision, and operates on a swivel to allow for adjustment as needed. All cameras offer a 120-degree view, ensuring that you’ll never have to worry about blind spots. • Simple install box makes it easy to connect up to four cameras at once. • Easily connects to a DVD player, making for a convenient second monitor. • Side camera is waterproof, has auto night vision, swivel capability, and a 120-degree view. • Convenient compact RV backup camera system. • Highly durable, waterproof camera has exceptional night vision and impressive adjustability. • Metal sunshield visor deflects glare. • Incredibly durable camera was built to handle harsh road conditions.